This article will cover how our permissions work for the social authorizations that can be associated with the hub: Facebook, LinkedIn, and Twitter. The most important thing to note is that our application will never ever, ever post automatically to any of your profiles. When our application makes a post or change on your behalf, it is because you have specifically agreed to do so within our interface (for example, by clicking Post to Twitter or Join LinkedIn Group). You will always be aware when something is about to be posted and you will always have the opportunity to opt-out or stop from posting. Your public profile: If you chose to sign up with Facebook, then we will use this info to fill out your profile. 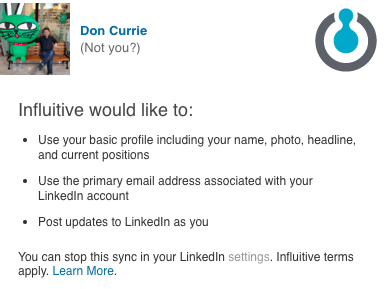 Post updates to LinkedIn as you: This allows Influitive to post to LinkedIn when you complete social sharing challenges. 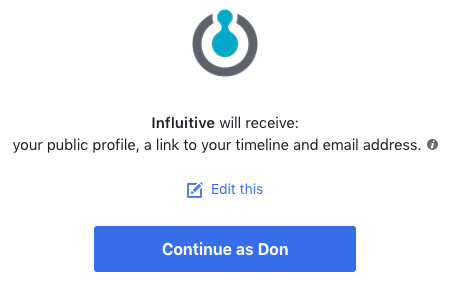 Influitive never posts updates that are not triggered by you. Update your profile: We do not require or use this access. 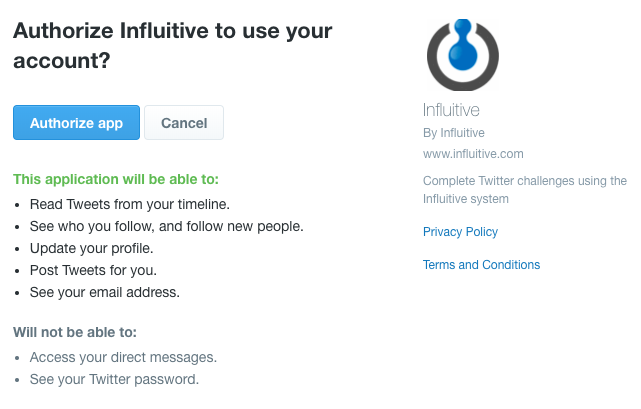 Twitter does not provide a deep level of granularity when apps such as Influitive ask for permission. It batches certain permissions together, and this one comes as part of the batch which includes the permissions we require. Post tweets for you: This enables the "Post to Twitter" or social sharing challenges which award points for tweeting.